This was a solo show at Ceri Hand Gallery's first London space in Covent Garden (31 Aug - 29 Sep, 2012) and took its title from a song by American industrial-metal band Prong. Originally written by 70s experimental-rockers Chrome, it was inspired by the Twilight Zone episode of the same name. Aired in the late 1950s, the episode follows the plight of two workers at a nuclear munitions factory. Highlighting a creeping paranoia and frustration for change present in the American (world) psychology of the day, the refrain from the song, "Everything's the same, nothing has changed, everything's the same, nothing has changed at all, changed in our world", alludes to a place or state of being that has become entirely paralysed by the inevitability of it's own apparent destiny. The show included a mixture of painting, photography, video, print, sculpture and sound and continued to explore my interests in social/political cntrol, aspiration, isolation, myth, legacy, language and its proposenity to fail. The title-work from the show, 'Third from the Sun' (2012), is a set of three light-boxes, seemingly depicting hypnotic cosmic universes. These are, in fact, images of stains, bleached in to the lino under the urinals in an arts centre. The video 'One in the Same Flesh' (2012), displays the burning of a 1970 Penguin Edition of 'The Moon and Sixpence' by W Somerset Maugham. 'The Only Thing That Matters is the Everlasting Present' (2012), is a printed image of the same book, rendered in flocking-medium and ash on paper. Their inspiration was Truffaut's film adaption of the Ray Bradbury novel, 'Fahrenheit 451', in which the book is featured atop a pile of others, destined to be burned. 'The Sun Was Lost Behind the Clouds' (2012), is a run of 230 prints; every page of a 1939 First Edition of John Steinbeck's 'The Grapes of Wrath', over-printed with an image of a farm worker in Kern County, California, burning copies of the book following its release. Other works included 'Drowning Dog' (2012), a security-camera video of a dog retrieving its dead companion from a Chilean highway, 'Class of 1986' (2012), an engraved American school-desk and 'For a Short Moment, I Felt Nothing' (2012), a photographic image of a hand-painted sign, floating away over hills beneath bright-red helium balloons. Also exhibited were two new multiple works. 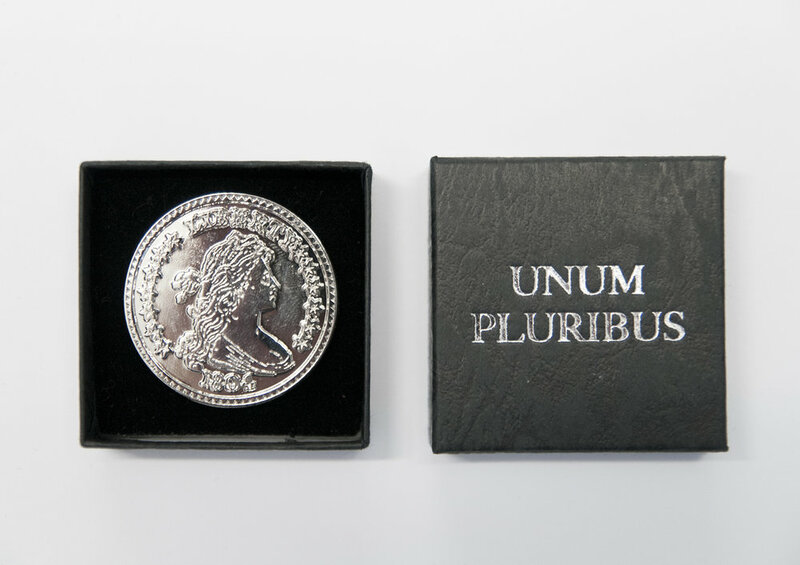 'Unum Pluribus' is a boxed, stamped- metal badge of an 1804 American silver dollar, in an edition of 51. The first of the edition sold cost 1p, the second 2p, the third 4p – the price doubling each time (by the time 51st edition is reached, there's not enough currency on the planet to buy it). 'I Have My Dreams While I'm Awake', is a 1980 Penguin Edition of Lautréamont's 'Maldoror', each of the 144 pages torn from the book and folded in to a paper aeroplane, packaged individually in a hand-stamped envelope. Had They Come to Say Goodbye?